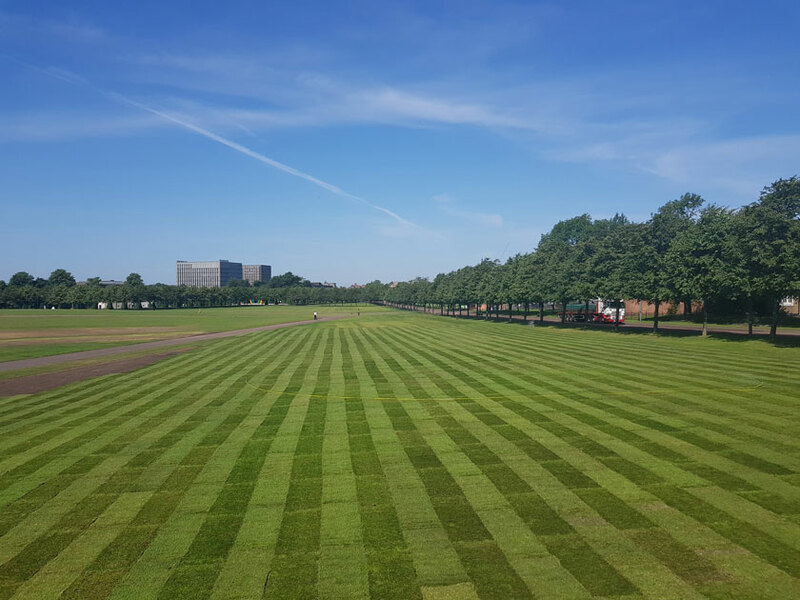 Read how Stewarts Turf, The Scottish Branch of Harrowden Turf Ltd recently supplied 3,800 square metres of turf to Glasgow Green. 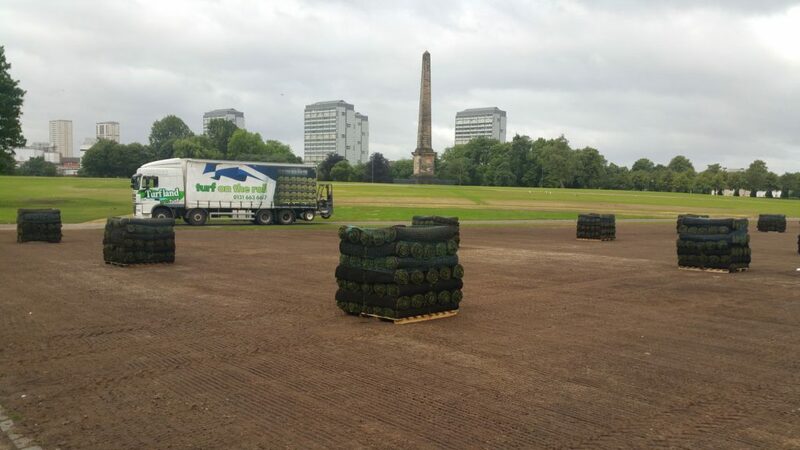 Glasgow City Council needed to refurbish part of the park after a 3 day music festival took its toll on the lawns. Glasgow Green has the proud accolade of being the oldest public park in Britain. The 55 hectares of land was granted to the Bishop of Glasgow by James II in 1450. In those early days, the green space would have been used to graze the cattle and horses used for food and transport, wash and bleach linen and dry and fix fishing nets. It is said that in 1765, James Watt, whilst wandering in Glasgow Green Park conceived the idea of the separate condenser for the steam engine. This invention is credited by some with starting the Industrial Revolution. In the last decade, thanks to the Glasgow Renewal Project, the park has been restored to glory and earned Green Flag Status. It is not a popular venue for a plethora of events and is in almost constant use. 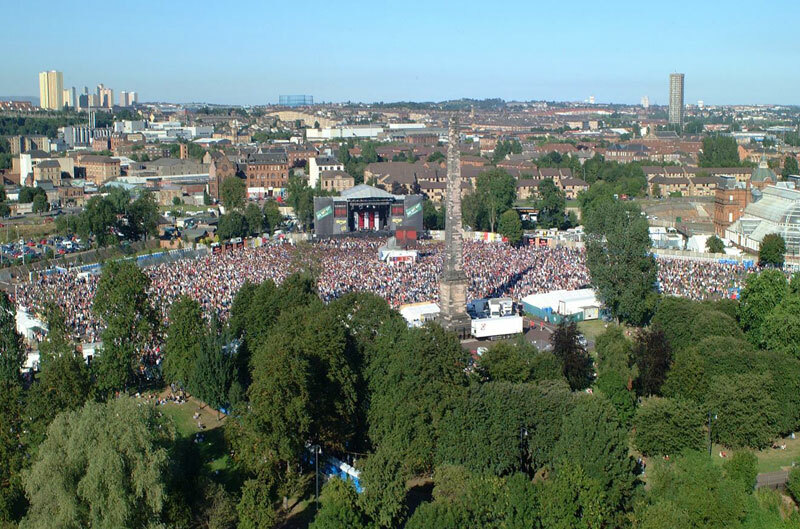 The Transmit music festival, held in Glasgow Green in July, attracted over 150,000 visitors over 3 days. Understandably, the grass was looking rather battered after all that activity. The decision was made to re-turf the 4 hectares that had been affected. Harrowden Turf’s Mark Coburn met with a representative of Glasgow City Council on site to discuss the practicalities. 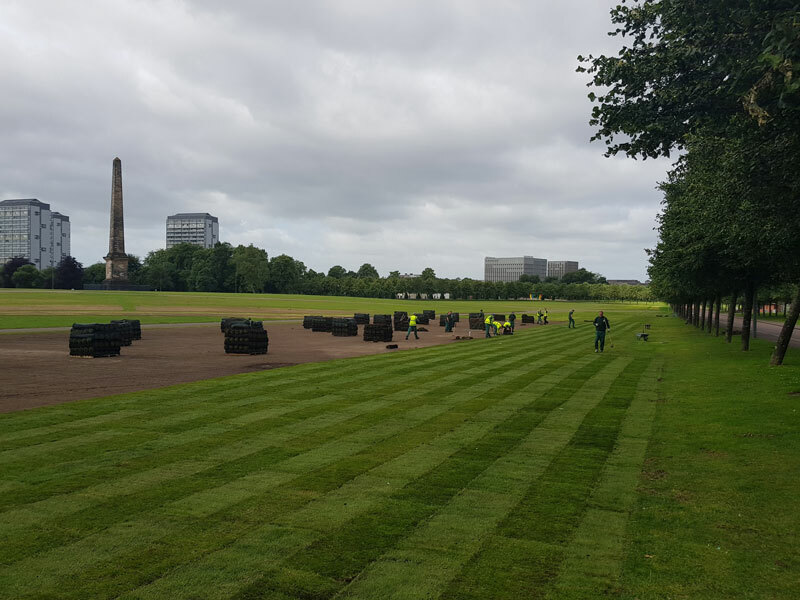 As a result, 3,800 square metres of turf was delivered in batches over the course of 2 days. A 15 strong team of landscapers worked tirelessly to get the turf laid as quickly as possible. Delivery driver Bill Findlay was praised by the landscape team for his outstanding customer service. Going above and beyond what is normally expected of him, Bill placed every pallet of turf exactly where the landscapers needed it to be. This saved them an enormous amount of time and allowed the turf to be laid quickly and efficiently. Bill also recorded progress with his camera and provided us with these magnificent images. Looking good. The 15 strong team of landscapers certainly knew what they were doing. Turf was laid in such a way that it is striped – looks amazing doesn’t it?